RLCS, Revista Latina de Comunicación Social, 72 – Pages 1.085 to 1.106 Funded Research | DOI:10.4185/RLCS-2017-1209en| ISSN 1138-5820 | Year 2017 voice (a story written in the first or third person) and similarity with the protagonist (who belonged or not to the same university as participants) on identification, so that “sharing a group membership with a character from a story told in first-person voice promoted an enhanced level of experience-taking” (p. 10). This result implies that it is possible for similarity to influence identification only in certain reception conditions. And, secondly, it is also possible for certain types of similarity to cause identification and narrative transportation states with greater efficiency and intensity. Therefore, it is necessary to further explore this line of research and explore the specific conditions in which the effect of similarity can be increased. An innovative feature of this work is the joint analysis of the effect of similarity on identification and transportation. In addition, the effect of a new type of similarity is contrasted: similarity in terms of social identity, which involves inducing in the audience the perception of an identity shared with the protagonist of the story, emphasizing their similarities not in demographic terms (place of origin) but in subjective aspects such as national sentiments (group of identification) and attachment to cultural elements (such as language or culinary preferences). In the context of the reduction of prejudice, it is a complex task to promote identification and transportation when narrative messages feature stigmatized immigrants and the audience members obtain no personal or specific benefit by changing their attitudes, unlike what happens in health campaigns (Walter et al., 2017). Therefore, in this case, the manipulation of similarity in terms of social identity can lead to more significant effects than the manipulation of similarity in demographic terms, by making salient cultural commonalities and the sense of social identity (“we are all part of the same group”). Understood in this way, similarity would be especially effective to stimulate greater identification and transportation if it is combined with an additional strategy: the training of the imagination (via imagined intergroup contact instructions) before the reading of the narrative message. Previous research has found that, by default, stigmatized characters foster less identification (Chung & Slater, 2013), and that people with more racist sentiment find it more difficult to identify with this type of characters (i.e., to imagine they are the character and take its perspective) (Igartua & Frutos, 2017). Therefore, a procedure intended to increase the capacity to imagine a positive encounter with a stigmatized immigrant may also have a direct impact on identification and narrative transportation provided the character is presented as similar to the audience. In this way, we hope that our experimental findings will shed light on the conditions under which similarity increases identification and transportation and indirectly impacts on the dependent variables. 1.2. Imagined intergroup contact as an exposure condition In the field of social psychology, it has been confirmed that one of the most effective strategies to reduce prejudice towards stigmatized groups is to facilitate interaction and direct contact between people from the ingroup and the outgroup (Pettigrew & Tropp 2006). In addition, it has been noted that the positive effects of the contact can be, although in an indirect way, vicarious or merely symbolic. The methods of indirect contact include intergroup media contact and imagined intergroup contact (Harwood, 2010; Park, 2012). Our work focuses on this last form of indirect contact, whose inclusion in communication research is very scarce and incipient (Chen et al., 2017; Harwood et al., 2017). RLCS, Revista Latina de Comunicación Social, 72 – Pages 1.085 to 1.106 Funded Research | DOI:10.4185/RLCS-2017-1209en| ISSN 1138-5820 | Year 2017 social life, the raising of his children, his mastery of the Spanish language and his sense of belonging. He also alluded to two issues related to the rejection of immigrants: many people think that immigrants take away the jobs from native Spaniards and that many people consider that there is a relationship between immigration and criminality. The protagonist of the story demanded greater tolerance towards immigrants and proposed measures such as punishing labor exploitation and developing educational campaigns and activities against racism and xenophobia. The experimental manipulation of the narrative was designed to stimulate a high (506 words) or low similarity (523 words) with participants in terms of social identity. To reinforce the similarity with the protagonist of the story certain aspects were taken into account: the fact of feeling Spanish (versus Moroccan in the condition of low similarity), telling he has Spanish friends (Moroccan), telling his favorite dish is of Spanish (Moroccan) origin, telling he regularly speaks with his children in Spanish (Arabic), telling they read mostly British (Pakistani) newspapers, telling he wants to continue living in Spain (or go back to Morocco), and telling he identifies himself with the Spanish (Moroccan) culture and flag. To strengthen the experimental manipulation, the narrative was accompanied by a photograph of Saîd in his room and one of the walls had a Spanish (Moroccan) flag. Two pilot tests were carried out. The first to select the photo accompanying the story and the second one to verify whether the manipulation of similarity was effective. 21 Spanish university students participated in the first pilot study (N=21). They valued three photographs of people of Moroccan origin (taken from catalogues with no copyrights) in terms of attractiveness, appearance, honesty, threatening and friendly character (with a 0-10 scale). We chose the photograph that obtained the highest score in the positive aspects (attractive, nice appearance, honesty and friendly character) and the lowest score in the negative aspects (threatening character). The second pilot test involved 54 students who were randomly assigned to two groups and whose task consisted of reading the narrative and answering a series of questions about it: “the message is clear and comprehensible”, “the message is credible” and “the message is interesting” (from 1 “strongly disagree”, to 7 “strongly agree”) and “to what extent do you think you have some things in common with Saîd” (from 0 “nothing” to 10 “very much”). No significant differences were obtained in the perception of clarity and understanding, credibility and interest of the message according to the type of narrative (with all the scores over 5 in all cases). In addition, participants who had read the narrative of high similarity with the protagonist gave significantly higher scores on the perception of similarity with the character (M = 4.96, SD = 2.49) than those who had read the narrative designed to stimulate low similarity (M = 3.35, SD = 2.99) (t(48.80) = -2009, p <. 05). 2.3. Measures Direct contact with Moroccan immigrants. Participants were asked: “how much contact do you have with immigrants from Morocco in your everyday life” (from 1= not at all to 5= a great deal; M = 2.32, SD = 1.01). Political self-positioning. Participants were asked to report their political ideology using a standard scale ranging from 0 (left) to 10 (right) (M = 4.35, SD = 2.53). RLCS, Revista Latina de Comunicación Social, 72 – Pages 1.085 to 1.106 Funded Research | DOI:10.4185/RLCS-2017-1209en| ISSN 1138-5820 | Year 2017 that Saîd was similar to them (M = 4.47, SD = 1.64) to a greater extent than participants who read the narrative in which the protagonist showed low similarity (M = 3.35, SD = 1.56). However, the manipulation of similarity did not influence the perceived realism or the attention given to the narrative (t(398) = -0.89, p = .374 and t(398) = -1.78, p = .075, respectively). 3.2. Joint effect of imagined contact and similarity on identification and transportation (H1) Hypothesis 1 proposed that participants would experience greater identification with the narrative’s protagonist (H1a) and narrative transportation (H1b) in the optimal reception condition of the message (imagined contact plus narrative led by an immigrant with high similarity), in comparison with the condition of reference (no imagined contact plus narrative led by an immigrant with low similarity). To contrast this hypothesis two ANOVA were performed, including as the independent variable the experimental condition (composed of four reception conditions) and as dependent variables identification and narrative transportation. In addition, since the optimal reception condition was expected to obtain higher values in identification and narrative transportation, compared with the control or reference condition, we also performed a planned contrast analysis (-1, 0, 0, 1) that compared condition 4 (imagined contact and high similarity with protagonist, coefficient 1) with condition 1 (no imagined contact and low similarity with protagonist, coefficient -1). Results showed that there were statistically significant differences in identification (F(3, 396) = 12.19, p < .001, ηp2 = 0.085) and narrative transportation (F(3, 396) = 9.34, p < .001, ηp2 = 0.066) according to experimental condition. In addition, both planned contrasts were statistically significant (identification: t(396) = 4.68, p < .001, r = .22; transportation: t(396) = 9.34, p < .001, r = .17). Participants in the optimal reception condition showed greater identification (mean difference = 0.59, ES = 0.12) and narrative transportation (mean difference = 0.66, ES = 0.18), than participants in the condition without imagined contact and protagonist with low similarity. Therefore, H1 received empirical support. 3.3. 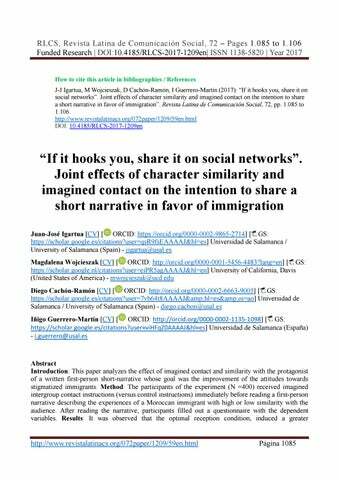 Joint effect of imagined contact and similarity on message-sharing intention (H2) Hypothesis 2 proposed that participants in the optimal reception condition of the message (imagined contact plus narrative led an immigrant with high similarity), in comparison with the condition of reference (no imagined contact plus narrative led by an immigrant with low similarity) would show greater intention to share the message through social networks. As in the previous case, we carried out an analysis of variance (ANOVA) and an analysis of planned contrast (-1, 0, 0, 1) to compare condition 4 (imagined contact and high similarity with the protagonist, coefficient 1) with condition 1 (no imagined contact and low similarity with the protagonist, coefficient -1). Results showed that there were statistically significant differences in the intention to share the message through social networks (F(3, 396) = 4.12, p < .01, ηp2 = 0.030) according to the experimental condition. In addition, the contrast showed statistically significant results (t(396) = 2.84, p < .01, r = .14). Participants in the optimal reception condition showed a greater intention to share the narrative (mean difference = 0.59, ES = 0.21) than participants in condition without imagined contact and protagonist with low similarity. Therefore, H2 was confirmed by data. Note. The figure shows non-standardized regression coefficients, B. The coefficients of the relative direct effects appear in parentheses. The dashed line represents non-significant coefficients. ** p < .01, *** p < .001. For the analysis of data with PROCESS, we introduced the experimental condition (variable X) as the multicategorical variable (with four levels). This procedure required the creation of three dummy variables (D1, D2, D3), which acted separately as independent variables, allowing the remaining dummy variables to act as covariables. This allowed us to quantify the relative indirect effects of being in an experimental group (condition 2, D1: no imagined contact and high similarity; condition 3, D2: imagined contact and low similarity; condition 4, D3: imagined contact and high similarity) in comparison with the reference group (condition 1: no imagined contact and low similarity) (see Hayes and Preacher, 2014, for an explanation, as well as Walter et al., 2017, for an application). Thus, our model allowed us to estimate the indirect effect of the optimal reception condition (the joint effect of imagined intergroup contact and high similarity with the protagonist, D3), in comparison to the reference group, on the intention to share the message, including identification and narrative transportation as mediating variables. Note. Table includes the B coefficients, which are non-standardized regression coefficients. Given that the experimental condition (X) was codified by creating three dummy variables (D1, D2, D3), each coefficient reflects the means difference in the intention to share the message in comparison to the reference group (condition 1: no imagined contact / low similarity). D1: no imagined contact / high similarity; D2: imagined contact / low similarity; D3: imagined contact / high similarity. The significant relative indirect effects are highlighted in bold (when the confidence intervals estimated through the bootstrapping method do not include the value zero). θ = omnibus test on the relative indirect effects. Funded research: This article is the product of the research project titled “Narrative tools to reduce prejudice. Effects of similarity, imagined contact, empathy and narrative voice” (reference number: CSO2015-67611-P), funded by the National Programme for the Promotion of Excellence in Scientific and Technological Research of the Spanish Ministry of Economy and Competitiveness. Dates: - Start of the project: 1 January 2016. - End of the project: 31 December 2019. 5. References Barbour, J. B., Doshi, M. J., & Hernández, L. H. (2015): “Telling global public health stories: narrative message design for issues management”. Communication Research, 43(6), 810–843. Ben-David, A., & Matamoros-Fernández, A. (2016): “Hate speech and covert discrimination on social media: monitoring the Facebook pages of extreme-right political parties in Spain”. International Journal of Communication, 10, 1167–1193. Berger, J., & Milkman, K. L. (2012): “What makes online content viral?” Journal of Marketing Research, 49(2), 192–205. Bilandzic, H., & Busselle, R. W. (2008): “Transportation and transportability in the cultivation of genre-consistent attitudes and estimates”. Journal of Communication, 58(3), 508–529. RLCS, Revista Latina de Comunicación Social, 72 – Pages 1.085 to 1.106 Funded Research | DOI:10.4185/RLCS-2017-1209en| ISSN 1138-5820 | Year 2017 Braddock, K., & Dillard, J. P. (2016): “Meta-analytic evidence for the persuasive effect of narratives on beliefs, attitudes, intentions, and behaviors”. Communication Monographs, 83(4), 446–467. Busselle, R., & Bilandzic, H. (2009): “Measuring narrative engagement”. Media Psychology, 12(4), 321–347. Cea D’Ancona, M. A., & Valles, M. S. (2014): Evolución del racismo, la xenofobia y otras formas conexas de intolerancia en España [Informe-Encuesta 2014]. Madrid: Ministerio de Empleo y Seguridad Social. Chen, C.-Y., Joyce, N., Harwood, J., & Xiang, J. (2017): “Stereotype reduction through humor and accommodation during imagined communication with older adults”. Communication Monographs, 84(1), 94–109. Chen, M., Bell, R. A., & Taylor, L. D. (2016): “Narrator point of view and persuasion in health narratives: the role of protagonist–reader similarity, identification, and self-referencing”. Journal of Health Communication, 21(8), 908–918. Cho, H., Shen, L., & Wilson, K. (2014): “Perceived realism: dimensions and roles in narrative persuasion”. Communication Research, 41(6), 828–851. Chung, A. H., & Slater, M. D. (2013): “Reducing stigma and out-group distinctions through perspective-taking in narratives”. Journal of Communication, 63(5), 894–911. Cohen, J. (2001): “Defining identification: a theoretical look at the identification of audiences with media characters”. Mass Communication & Society, 4(3), 245–264. Cohen, J., Tal-Or, N., & Mazor-Tregerman, M. (2015): “The tempering effect of transportation: Exploring the effects of transportation and identification during exposure to controversial two-sided narratives”. Journal of Communication, 65(2), 237–258. Cohen, J., Weimann-Saks, D., & Mazor-Tregerman, M. (2017): “Does character similarity increase identification and persuasion?”. Media Psychology. Crisp, R. J., & Husnu, S. (2011): “Attributional processes underlying imagined contact effects”. Group Processes & Intergroup Relations, 14(2), 275–287. Crisp, R. J., Husnu, S., Meleady, R., Stathi, S., & Turner, R. N. (2010): “From imagery to intention: A dual route model of imagined contact effects”. European Review of Social Psychology, 21(1), 188–236. Crisp, R. J., & Turner, R. N. (2009): “Can imagined interactions produce positive perceptions? Reducing prejudice through simulated social contact”. The American Psychologist, 64(4), 231–240. Crook, B., Stephens, K. K., Pastorek, A. E., Mackert, M., & Donovan, E. E. (2016): “Sharing health information and influencing behavioral intentions: the role of health literacy, information overload, and the internet in the diffusion of healthy heart information”. Health Communication, 31(1), 60–71. de Graaf, A. (2014): “The effectiveness of adaptation of the protagonist in narrative impact: similarity influences health beliefs through self-referencing”. Human Communication Research, 40(1), 73–90. de Graaf, A., Hoeken, H., Sanders, J., & Beentjes, J. W. J. (2012): “Identification as a mechanism of narrative persuasion”. Communication Research, 39(6), 802–823. RLCS, Revista Latina de Comunicación Social, 72 – Pages 1.085 to 1.106 Funded Research | DOI:10.4185/RLCS-2017-1209en| ISSN 1138-5820 | Year 2017 de Graaf, A., Sanders, J., & Hoeken, H. (2016): “Characteristics of narrative interventions and health effects: a review of the content, form, and context of narratives in health-related narrative persuasion research”. Review of Communication Research, 4, 88–131. Green, M. C., & Brock, T. (2002): “In the mind’s eye: Transportation-imagery model of narrative persuasion”. In M. C. Green, J. J. Strange, & T. C. Brock (Eds. ), Narrative impact. Social and cognitive foundations (pp. 315–341). Mahwah, NJ: Lawrence Erlbaum Associates. Green, M. C., & Brock, T. C. (2000): “The role of transportation in the persuasiveness of public narratives”. Journal of Personality and Social Psychology, 79(5), 701–721. Green, M. C., Brock, T. C., & Kaufman, G. F. (2004): “Understanding media enjoyment: the role of transportation into narrative worlds”. Communication Theory, 14(4), 311–327. Harwood, J. (2010): “The contact space: a novel framework for intergroup contact research”. Journal of Language and Social Psychology, 29(2), 147–177. Harwood, J., Joyce, N., Chen, C.-Y., Paolini, S., Xiang, J., & Rubin, M. (2017): “Effects of past and present intergroup communication on perceived fit of an outgroup member and desire for future intergroup contact”. Communication Research, 44(4), 530–555. Hayes, A. F. (2013): Introduction to mediation, moderation, and conditional process analysis. Nueva York, NY: The Guilford Press. Hayes, A. F., & Preacher, K. J. (2014): “Statistical mediation analysis with a multicategorical independent variable”. British Journal of Mathematical and Statistical Psychology, 67, 451–470. Hoeken, H., & Fikkers, K. M. (2014): “Issue-relevant thinking and identification as mechanisms of narrative persuasion”. Poetics, 44, 84–99. Hoeken, H., Kolthoff, M., & Sanders, J. (2016): “Story perspective and character similarity as drivers of identification and narrative persuasion”. Human Communication Research, 42(2), 292– 311. Igartua, J. J. (2010): “Identification with characters and narrative persuasion through fictional feature films”. Communications, 35(4), 347–373. Igartua, J. J. (2015): “Psicología social de los medios de comunicación”. In J. M. Sabucedo & J. F. Morales (Eds. ), Psicología social (pp. 371–391). Madrid: Panamericana. Igartua, J. J., & Barrios, I. (2012): “Changing real-world beliefs with controversial movies: processes and mechanisms of narrative persuasion”. Journal of Communication, 62(3), 514–531. Igartua, J. J., & Fiuza, D. (2017): “Persuading with narratives against gender violence. Effect of similarity with the protagonist on identification and risk-perception”. Palabra Clave (en prensa). Igartua, J. J., & Frutos, F. J. (2017): “Enhancing attitudes toward stigmatized groups with movies: Mediating and moderating processes of narrative persuasion”. International Journal of Communication, 11(1), 158–177. Igartua, J. J., & Vega, J. (2016): “Identification with characters, elaboration, and counterarguing in entertainment-education interventions through audiovisual fiction”. Journal of Health Communication, 21(3), 293–300. RLCS, Revista Latina de Comunicación Social, 72 – Pages 1.085 to 1.106 Funded Research | DOI:10.4185/RLCS-2017-1209en| ISSN 1138-5820 | Year 2017 Kaufman, G. F., & Libby, L. K. (2012): “Changing beliefs and behavior through experience-taking”. Journal of Personality and Social Psychology, 103(1), 1–19. Kim, M., Shi, R., & Cappella, J. N. (2016): “Effect of character–audience similarity on the perceived effectiveness of antismoking PSAs via engagement”. Health Communication, 31(10), 1193–1204. Knobloch-Westerwick, S., & Johnson, B. K. (2014): “Selective exposure for better or worse: its mediating role for online news’ impact on political participation”. Journal of Computer-Mediated Communication, 19(2), 184–196. Kreuter, M. W., Green, M. C., Cappella, J. N., Slater, M. D., Wise, M. E., Storey, D., … Woolley, S. (2007): “Narrative communication in cancer prevention and control: a framework to guide research and application”. Annals of Behavioral Medicine, 33(3), 221–235. Miles, E., & Crisp, R. J. (2013): “A meta-analytic test of the imagined contact hypothesis”. Group Processes & Intergroup Relations, 17(1), 3–26. Moyer-Gusé, E. (2008): “Toward a theory of entertainment persuasion: explaining the persuasive effects of entertainment-education messages”. Communication Theory, 18(3), 407–425. Moyer-Gusé, E., Chung, A. H., & Jain, P. (2011): “Identification with characters and discussion of taboo topics after exposure to an entertainment narrative about sexual health”. Journal of Communication, 61(3), 387–406. Murphy, S. T., Frank, L. B., Chatterjee, J. S., & Baezconde-Garbanati, L. (2013): “Narrative versus Nonnarrative: The Role of Identification, Transportation, and Emotion in Reducing Health Disparities”. Journal of Communication, 63(1), 116–137. Oatley, K. (2017): “Fiction: simulation of social worlds”. Trends in Cognitive Sciences, 20(8), 618– 628. Park, S.-Y. (2012): “Mediated intergroup contact: concept explication, synthesis, and application”. Mass Communication and Society, 15(1), 136–159. Pettigrew, T. F., & Tropp, L. R. (2006): “A meta-analytic test of intergroup contact theory”. Journal of Personality and Social Psychology, 90(5), 751–783. Sevillano, V., Basabe, N., Bobowik, M., & Aierdi, X. (2014): “Health-related quality of life, ethnicity and perceived discrimination among immigrants and natives in Spain”. Ethnicity & Health, 19(2), 178–197. Slater, M. D., & Rouner, D. (2002): “Entertainment-Education and Elaboration Likelihood: understanding the processing of narrative persuasion”. Communication Theory, 12(2), 173–191. Tal-Or, N., & Cohen, J. (2010): “Understanding audience involvement: conceptualizing and manipulating identification and transportation”. Poetics, 38(4), 402–418. Tal-Or, N., & Cohen, J. (2015): “Unpacking engagement: convergence and divergence in transportation and identification”. Annals of the International Communication Association, 40(1), 33–66. Tukachinsky, R. (2014): “Experimental manipulation of psychological involvement with media”. Communication Methods and Measures, 8(1), 1–33. Article received on 19 August 2017. Accepted on 17 September. Published on 27 September 2017.